Serves: mmm... more than one if anyone else in the house is fast enough to catch a piece ;-). In a small bowl, dissolve the yeast in the warm water. Let sit for 5 minutes while it reactivates. 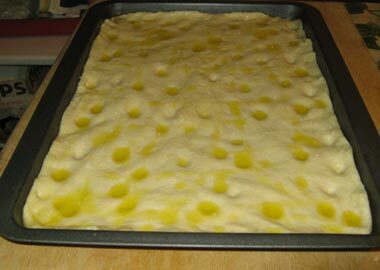 In a large bowl, mix the flour, salt, olive oil and dissolved yeast. Knead until smooth, about 10 minutes. Place in oiled bowl, cover and let rest in warm spot for about 1 to 1 ½ hours. 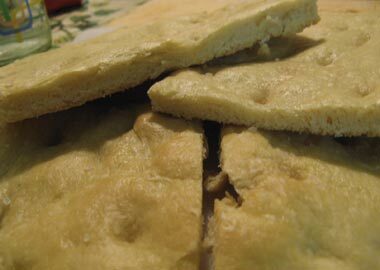 Oil a wide baking pan and spread out the dough with your fingers across the entire pan. With your fingers, make dents on the surface and then drizzle olive oil on top, then sprinkle sea salt. Let rest for about 30 minutes while your oven is getting hot. Heat oven to 220 °C (430°F). Bake for 20 minutes and drizzle some fresh olive oil as you bring it out of the oven. Enjoy either by itself or with cold cuts to make a delicious panino!